On commencement day, Amanda Lawn ’17, an elementary education and special education double major, will graduate alongside her father, Robert “Bob” J. Lawn Jr. ’17, of Pipersville, Pennsylvania. A Plumstead Township police officer, Bob will receive a Bachelor of Science in criminal justice. From a young age, Bob felt a calling to be a police officer. He began training for the police force at 21 and has been in the profession for 25 years. He attributes his positive attitude and mission to care for others as driving forces in working what he calls his dream job, as well as the Catholic faith he was raised with and continues to follow. 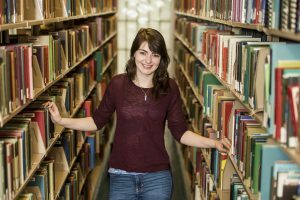 Amanda’s student experience also features a strong connection to the University. In addition to being a Kinney SCHOLAR and a leader of a Campus Ministry Koinonia student group and participating in service trips with APEX, and, this summer, Collegiate Challenge, she has learned through her Jesuit education how to join others, especially her dad, in serving others. Following graduation, Amanda hopes to substitute teach in Bucks County before securing a position as a special education teacher for elementary school students. Bob, a member of Alpha Kappa Delta, the International Sociology Honor Society and Alpha Phi Sigma, the National Criminal Justice Honor Society, will continue working as a police officer and look for ways to keep learning. Bob Jr. and Amanda are an SJU legacy family. Read more about their deeper connection to Saint Joseph’s on the SJU News website. Follow @sjuartssciences & @haubschool on Twitter to learn about a new member of the class of #Hawk17. Many new experiences are in store for David Pagliarulo ’17, a psychology major with minors in interdisciplinary health services and art. After graduating, Pagliarulo will move to Paris, France to study global communications at the American University of Paris. Once Pagliarulo completes his masters degree in global communications, he hopes to work on marketing and branding communications for global companies. For now, the Bethlehem, Pennsylvania native knows that living in Paris will be a major change — but it’s one he’s excited to embrace. This weekend, commencement will be a family affair for the Alexanders of Sellersville, Pennsylvania, as siblings Shannon, a pharmaceutical and healthcare marketing major, and Chris, a master’s of business administration in finance candidate, receive their diplomas. As an undergraduate student, Chris was a founding member of the Dean’s Leadership Program and a member of Gamma Iota Sigma, the risk management, insurance and actuarial fraternity. As a graduate student, he became involved in the alumni association and worked as a graduate assistant in the MBA office. Next, he looks to continue his studies in law school. Also headed back to school? His sister Shannon. After graduating this weekend, Shannon will spend the summer interning for Symphony Health Solutions, a pharmaceutical market research company, before returning to campus to pursue a master’s degree in marketing. Originally a chemical biology major, Shannon made the switch to pharmaceutical marketing during her freshman year and soon found a mentor in business and analytics manager and adjunct professor, Paras Bhagat. “He challenged me to think beyond the problem at hand and look at the bigger picture,” she says. An orientation leader and Hawk Host, Shannon credits the HSB faculty for shaping her definition of leadership. Follow @sjuartssciences & @haubschool on Twitter to learn about a new member of the class of #Hawk17 each weekday. After earning his master’s degree in criminal justice this May, Thomas Lafferty ’17 (M.S.) will travel to the African nation of Swaziland to work as a youth development volunteer for the Peace Corps. For 27 months, Lafferty will focus on helping young people improve their educational opportunities and encouraging them to make healthy lifestyle choices. He’ll also teach English, prepare older children for the rigors of finding a job or applying to college, and help all of them to develop effective life skills. More specifically, he’ll combat gender inequality by empowering girls, and will also work with orphans and other vulnerable children. While working on his degree, Lafferty volunteered with the World Affairs Council’s Global Smarts Mentoring Program, a partnership between SJU and the Council. The Holy Family University alumnus instructed six Gesu middle school students once a week. His group successfully represented Kenya at the Jr. Model United Nations debate conference held at Temple University last spring. With his focus now trained on Swaziland — and his compassion for marginalized youth in gear — Lafferty is ready and willing to take on new challenges and gain new perspectives. A full profile about Lafferty is available on the SJU News website. Luigi Nuñez ’17, a graduating senior from Camden, New Jersey, carrying a double major in computer science and mathematics, has been named a recipient of a fellowship from the Global Health Corps (GHC). As a fellow, Nuñez will travel to Kampala, Uganda, to serve as an e-learning officer with the Program for Accessible Health Communication and Education (PACE). The GHC is a U.S. nonprofit organization that offers competitive fellowships to support emerging global health leaders. Each year, GHC selects young professionals for paid, yearlong fellowships with organizations that promote health equity in Africa and the United States. For each Global Health Corps site, one local fellow and one international fellow are selected to promote cross-cultural awareness and understanding. More than 5,000 people apply for approximately 100 fellowships each year. During his fellowship, Nuñez will serve in PACE’s IT sector, evaluating data to determine the success and failure rates of its projects and working with other departments to create and implement solutions to improve the efficiency of their initiatives to promote health equity. McNulty Scholars and Associate Scholars, in addition to receiving scholarships, benefit from extensive research opportunities, and faculty and peer mentoring throughout their education at Saint Joseph’s. McNulty Fellows receive support to conduct summer research and to attend research conferences. All members of the program also participate in ongoing leadership training and professional development. The innovative program was begun by Anne Welsh McNulty to honor the memory of her husband, alumnus John P. McNulty ’74, who was known for his philanthropy and his belief in the power of women to achieve greatness in their chosen fields. At the intersection of the Arts and Sciences lies the academic career of Joseph Thomas ’17. Prior to enrolling in Saint Joseph University’s Writing Studies program, Thomas studied biology at Arcadia University and has spent over nine years in the U.S Army as a medic. Despite his background and early career in the sciences, Thomas never stopped pursuing his passion for writing. He posits elementary school as the first place his love for wordplay began. “I was interested in narrative, writing and visual art since I was a kid, but I didn’t come from the kind of household where that was acceptable, so I discarded it,” says Thomas. Although his early interests in writing weren’t entirely supported, Thomas continued to hone his skills as he matured, exploring various subjects and different mediums for inspiration. Thomas’ appreciation for genres of writing led him to SJU’s Writing Center where he worked as a graduate writing tutor while pursuing his MA. Self-described as “a Black poet and memoirist from Philly,” Thomas currently uses his blog to write speculative fiction centered on disenfranchisement, coming of age as a person of color, and war. After graduation, Thomas will enroll at Notre Dame University in the fall to begin working on his MFA in fiction. “For most of my life I’ve seen no representative, let alone positive or usable art that reflects who I am, who my mother is, siblings are, or friends and family were, or where we came from,” says Thomas. Throughout the program, Thomas credits Aisha Lockridge, Ph.D., associate professor of English, who pushed him to persevere through the program. Thomas’ most recent collection of short stories titled, More than Foreign War, uses speculative fiction to disrupt and displace the majority-centered heteropatriarcal structures of military life. His most recent work has also been featured in Apiary Magazine and Philadelphia Printworks. His poetry can be found in Philadelphia Stories and he was a finalist for the Sandy Crimmins National Prize in Poetry. The finance and risk management & insurance double major was offered a job after executives witnessed a presentation she gave during her Property and Casualty course. According to Bui, Validus generally only hires highly experienced professionals due to the firm’s specialized industry. However, company executives were so impressed with the senior’s presentations at their London and Bermuda offices that they offered her a position in March. Bui will take a position at the New York Office of Validus in the World Trade Center where she will spend the next one and a half to two years as an underwriter trainee developing various types of insurance policies. She will have the opportunity to rotate throughout the company’s numerous international locations such as London, England; Pembroke, Bermuda; Sydney, Australia; and Dubai, United Arab Emirates. The Fairfax, Virginia, native has been an orientation leader, the executive vice president of SJU’s risk management & insurance fraternity Gamma Iota Sigma, a member of SJU’s co-ed business fraternity Delta Sigma Pi and a Summer Scholar. She is also a member of the Spencer team, an SJU risk management & insurance group that recently earned first place in a national case competition at the annual Risk Management Society (RIMS) Conference and Exhibition. A full profile about Bui is available on the SJU News website. 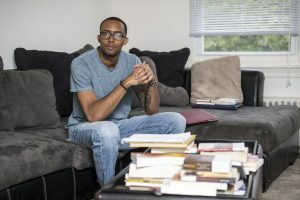 When the law school acceptance notices started to accumulate in senior psychology major Prince Charles Yakubu’s inbox, and the formal letters arrived at his home in St. Louis, his mother was “really excited,” says Yakubu. But it wasn’t until he’d heard from all seven schools — the University of Denver, Drexel, Howard, Loyola University of Chicago, Saint Louis, Santa Clara, and Villanova — and all seven had said yes, that his father weighed in. “He told me he knew it was going to happen,” says the SJU men’s track and field team captain and triple jumper. 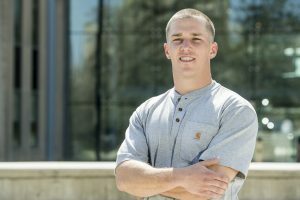 The political science minor says the hard part was choosing where he would spend the next three years. To get a feel for the best fit, Yakubu went home to visit St. Louis — where he attended the Jesuit St. Louis University High School — journeyed to Denver, and took a trip up the street to Villanova. Though he liked Denver, the future criminal defense attorney says he chose Villanova law school because he’s grown to enjoy Philadelphia and can see himself practicing law here. 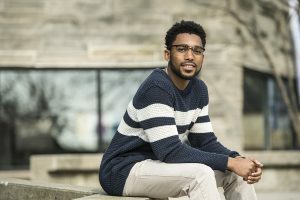 “I feel that with the connections I’ve made through SJU’s pre-law program, and those I will make at Villanova, that there will be a place for me in Philadelphia,” he says. Since he’s staying in the Philadelphia area, and Villanova is only a hop, skip and jump away from Hawk Hill, he knows he won’t have far to go to find community. “When Hawks see other Hawks, no matter where we are, we band together,” Yakubu says. A full profile about Yakubu is available on the SJU News website. After being accepted into three dental schools, Orwigsburg, Pennsylvania, native Jackie Boran ’17 will take the next step in her career path by heading to University Of Pittsburgh School Of Dental Medicine this fall. The biology major and philosophy minor has been involved in many activities outside of the classroom, including as an undergraduate researcher in an SJU microscopic roundworm lab, a Community Partnership Coordinator at West Catholic High School, and the Vice President of Alpha Epsilon Delta Pre Health Professional Honor Society. She credits these experiences to both her spiritual and academic growth. “Through weekly service and immersion trips, my understanding of Catholic social teachings as well as my faith has grown. Through research faculty mentorships, science and liberal arts classes, I have been challenged to think critically and analytically,” says Boran. In the Fall of his senior year, Ambler, Pennsylvania native Sean Cincotta ’17 boarded a private plane headed to Little Rock, Arkansas, for a final interview at the headquarters of family-owned finance company, Stephens Financial. By the time he stepped back onto the ground in Pennsylvania, he had a call with a job offer. “I first saw the opening posted on the SJU career site, by an alumnus working in the New York office,” says Cincotta, a finance and accounting major. “I was attracted to the family culture of Stephens, which is a lot like SJU. Here, people are committed to each other, it’s a close-knit, encouraging community where you can go outside your comfort zone and meet new people. I wanted to find that in a workplace, too,” he says. After graduation, Cincotta will be working out of the company’s New York office as an investment banking analyst. During his time at SJU, he participated in the University’s co-op program, which follows an accelerated format, allowing students to graduate in four years. Cincotta credits the co-op program with preparing him for his career by submerging him in professional environments and teaching him valuable lessons about time management, teamwork, communication and how to work with a wide array of people. Stokes with her City Year acceptance. 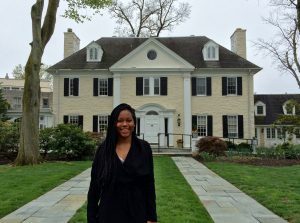 Brittany Stokes ’17, a criminal justice major from Philadelphia, will make the most of her gap year before law school with her placement with City Year. She’ll spend the next year working with children in under-resourced Philadelphia schools. Her mission is to enhance the educational experience of school children, work with teachers and run after-school programs. 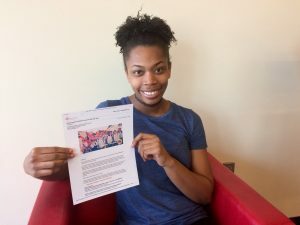 “My job is to show students that they matter, and I will always push to make them be better learners than they were the day before,” says Stokes, who worked in SJU’s Center for Inclusion and Diversity and was also a captain of the women’s crew team. “I’m so excited to take this new step in my life and see more of what the world has to offer,” says Ritzert. The Fulbright Program is one of the most competitive scholarship opportunities in the United States. Approximately eight students per year are selected for the Fulbright ETA in Slovakia. Ritzert is one of the few to make it through Fulbright’s highly selective application process, which is based on academic excellence and personal accomplishment. 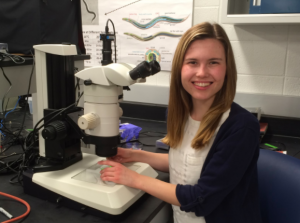 During her time as an undergraduate, Ritzert has racked up a number of achievements. In addition to working as a tutor in the SJU Writing Center, Ritzert manages the distribution of The Hawk student newspaper, plays on the women’s rugby team, earned acceptance into Sigma Tau Delta English honors society, and studied abroad in Tokyo, Japan, as a sophomore. Currently, she’s writing a 300-page novel as an independent study project. While Ritzert has always been interested in writing, it was her love of tutoring English as a Second Language (ESL) students in the Writing Center that inspired her to apply for the Fulbright ETA. “Every time I come back from a Writing Center appointment where I’m working with an ESL student, I always have this huge smile on my face and this sense of fulfillment,” Ritzert says. Once she completes her placement in Slovakia, Ritzert hopes to pursue the Alliance for Catholic Education (ACE) SJU Program or an M.F.A. in creative writing. A full profile about Ritzert is available on the SJU News website. 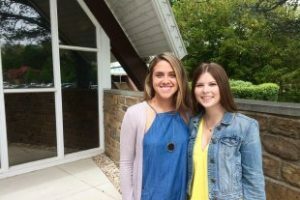 Katrina Nicolaides ’17 of Glen Mills, Pennsylvania, an elementary education major, and Allison Samson ’17, from Sandy Hook, Connecticut, who is also an elementary education major, are two of 47 undergraduate SCHOLARS (Students Committed to Helping Others Learn about Autism Research and Support) from the Kinney Center for Autism Education and Support who will graduate May 20. This group is the largest class of SCHOLARS to graduate since the Kinney Center’s founding in 2009. Many SCHOLARS in the Class of 2017 have already leveraged their time at the Kinney Center to find full-time positions in schools, special education programs or service agencies. Nicolaides will be working as an instructional assistant at A Step Up Academy, a special education school in Jenkintown, Pennsylvania. Other SCHOLARS will go on to graduate programs in special education, and some will combine graduate school with practical work experience.Samson has accepted a teacher-scholar position with Melmark, a special education and service center in Berwyn, Pennsylvania. She will simultaneously extend her education at SJU by one year to complete a master’s degree in special education. A full story is available on the SJU news site. Claribel Villa has big plans for the future: She hopes to become a social worker in the Latino community. The sociology and Spanish double major is making big strides toward that goal by attending the master’s degree program at the School of Social Work of Boston College this fall. 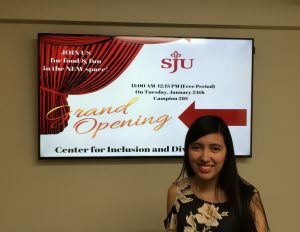 The Camden, New Jersey native made the most of her time at SJU as co-president of the Latino Student Association (@SJU_LSA), a member of Alpha Sigma Nu Jesuit Honor Society and an ICC scholar. She also worked in SJU’s Center for Inclusion and Diversity. Villa cites a family member’s experiences with therapy for her desire to pursue a career in social work. Villa admits feeling nervous about graduation, but ultimately, is excited to take the next step and attend graduate school. 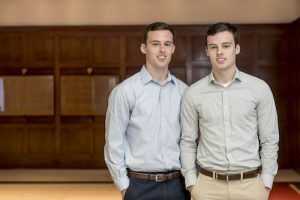 Matthew and Tyler Eads ’17, identical twins from Collegeville, Pennsylvania, will both graduate from SJU with degrees in business intelligence and analytics (BIA) this May. Over the past for years, the Eads have roomed together, taken classes together and even started their own business together. Both active in the BIA department, the twins boast strong academics and are involved in numerous clubs. Matthew is a member of the Business Information and Technology Society (BITS), the Tableau User Group and the American Marketing Association; has worked as a Best Buddies volunteer; and also interned with Tokio Marine North America Services. Tyler is a member of BITS and the Tableau User Group. He also interned with the HEADstrong Foundation for cancer patients, where he contributed to the nonprofit’s marketing and graphic design efforts. The twins also took part in SJU’s first BIA Johnson & Johnson Case Competition. One of the brothers’ most impressive joint achievements is a business they created and manage together: EadsGraphic, a design company that provides clients ranging from local businesses to Division I athletes with custom promotional graphics. Running a company while completing their undergraduate degrees has been a challenging but rewarding experience for Matthew and Tyler. A full profile about Francis-Thompson is available on the SJU news site. 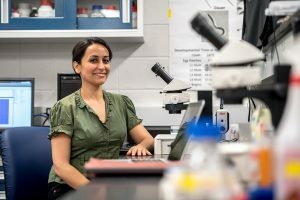 Riazati, who is graduating this month with a master’s of science degree in biology from Saint Joseph’s University, is a native of Iran and a member of the Baha’i faith. Iran refuses to recognize Baha’i as an official religion because, among other teachings, Baha’is believe in equality between men and women and in the independent investigation of truth — there are no religious leaders or clergy — which is contrary to Islam’s authoritarian structure. Since the 1979 Islamic Revolution, the Iranian government has spread rumors that Baha’is are spies, tortured and killed them and instituted policies to systematically persecute those who follow the faith. The discriminatory policies include denials of employment, government benefits and access to higher education. The last is a particularly harmful suppression, because universal and compulsory education is crucial to Baha’i teaching. Before enrolling in SJU’s Interdisciplinary Doctorate of Educational Leadership Program, Nyshawana Francis-Thompson was a special education teacher and liaison for the School District of Philadelphia. While the rewards of teaching ignited her passion to make a bigger impact in the lives of others, she credits the program for giving her the confidence and skills to achieve this goal. This May, Katie Boutin ’17 will be leaving Hawk Hill and joining McKee Risk Management in King of Prussia, where she’ll work as an Underwriter Trainee. While she’ll only be a few miles from SJU after graduation, the risk management and insurance major from Gettysburg, Pennsylvania knows that she’ll be leaving a lot behind. 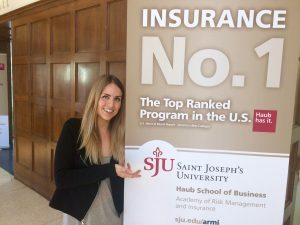 But Boutin, who is a member of Gamma Iota Sigma risk management and insurance fraternity and Alpha Gamma Delta sorority, is confident that SJU, as well as her co-op with United States Liability Insurance, has prepared her for what’s next. After commencement, Sarah Cooney ’17 will be traveling to the other side of the country to continue her education. An associate John P. McNulty Scholar, Cooney is a mathematics and computer science double major with a minor in English from Mifflinburg, Pennsylvania. 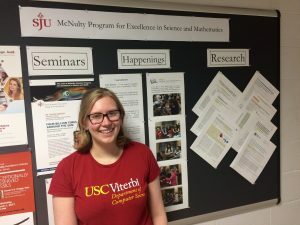 She has been accepted to the University of Southern California’s (USC) Viterbi School of Engineering to study for a Ph.D. in computer science. “At USC, I will be part of a group that is using artificial intelligence algorithms and techniques to target problems such as healthcare advocacy for homeless populations and ranger schedules to stop poaching in African national parks,” Cooney says. 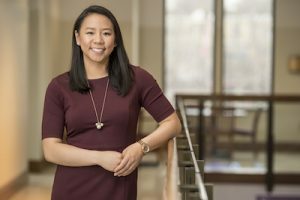 After earning her Ph.D., Cooney — who is a member of Phi Beta Kappa and Upsilon Pi Epsilon computer science honors society, president of Pi Mu Epsilon math honors society, a tutor in the Writing Center, and a supplemental instruction peer leader at SJU — plans to enter academia as a professor or conduct problem-solving research in the computer science industry. 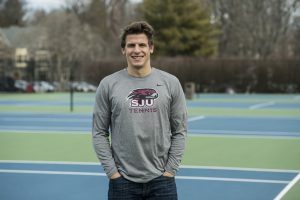 Tennis is what initially brought Tempe, Arizona native Kyle Chalmers ‘17 to the East Coast to attend Saint Joseph’s University, but once he settled into Hawk Hill, he dove into the full experience. During his four years, the captain of the Hawks tennis team was also involved as an orientation leader, Hawk Host Tour Captain, Delta Sigma Pi Senior Vice President, and Ignite Retreat Leader. He was also active in academics. 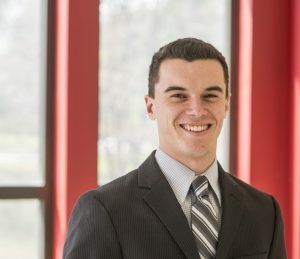 A business intelligence and analytics and economics major with a minor in finance, Chalmers was a member of the economics honor society and Beta Gamma Sigma, the business honor society at SJU. During his junior year he was was awarded the 2016 Information Systems Audit and Control Association’s academic scholarship for his essay on the changing nature of mobile applications within business operations. He completed internships with Karlene Keogh Parks for Phoenix City Council, Cotiviti, and PricewaterhouseCoopers. Chalmers last internship turned into a full-time offer well before graduation. This fall, Chalmers will join the Advanced Risk Compliance and Analytics Solutions team for the Philadelphia branch of PricewaterhouseCoopers. “I will be looking at data issues that require analytical solutions and suggest what companies can do better based on patterns in their data,” he says. Though he doesn’t start until September, his active Hawk won’t be taking the summer off. “Before I start my job, I’ll spend the month of August at Kino Border Initiative, a Jesuit organization located on the Arizona and Mexico border in the city of Nogales. I will educate school groups on how immigration policies affect people on both sides of the border,” says Chalmers. As he leaves SJU, he feels inspired and ready to succeed at both his career and this volunteer experience. Ashley Varghese ’17 has a major goal for her future: to turn her passion into a career. 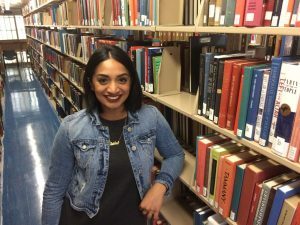 Varghese, a criminal justice major from Upper Darby, Pennsylvania, plans to attend law school in order to help reform the juvenile justice system, an issue that was made real to her during her time in the Inside-Out Service Learning course. While Varghese is still in the process of applying to law schools and plans to take a gap year before she enrolls, she is no stranger to being an activist for causes she believes in. In addition to serving as a resident assistant and orientation leader at SJU, Varghese was involved in the Women’s Leadership Initiative, took part in Relay for Life, and served as a student worker in the Office of Inclusion and Diversity. She also performed for Pope Francis with Maths Dance Academy (traditional Indian dance) when he visited Philadelphia in 2015. 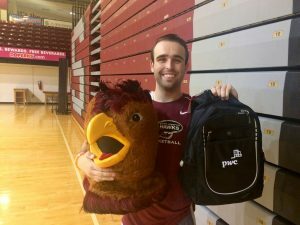 Timmy Parks ’17 doesn’t play on the men’s basketball team, but he’s just as well known as most of the athletes — for the last two seasons, Parks has served as the Hawk mascot at games, events and campus celebrations. Though Parks, an accounting major with a business intelligence minor from Wilmington, Delaware, is leaving the Hawk suit behind when he graduates, he knows that he’ll always be an SJU alumnus. “One of the things that excites me the most about my future is knowing that I will always be a Hawk and a part of this university,” Parks says. 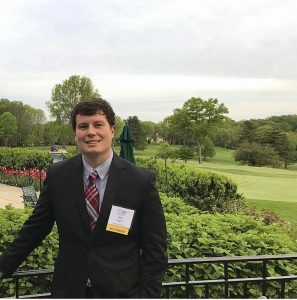 When it comes time to leave the nest in May, Parks, who is also a member of Delta Sigma Pi business fraternity, Beta Gamma Sigma business honors society, and the Sutula Accounting Scholars program, will be heading for PwC in Philadelphia. There, he’ll join the Core Assurance Group as an Associate. If you’ve ever seen an artist blowing glass, you likely marveled at the cooling process, as the material goes from a malleable, liquid-like substance into something that is solid and delicate. 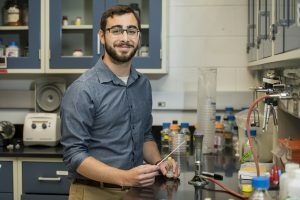 This change is known as the glass transition, and it’s at the center of research that Zachery Brown, a graduating senior from Pittsburgh, Pennsylvania, has conducted with Piotr Habdas, Ph.D., associate professor and chair of physics, over the last several years. Brown and Habdas’ research focuses on colloidal glasses. A colloid is a mixture of a microscopic, insoluble particles in a liquid; in this case, acrylic spheres in a solvent. Instead of being influenced by temperature, colloidal glasses transition through states based on the ratio of particles to liquid. In Habdas’ lab, using a specialized microscopy technique, Brown measures the movement of the spheres as he introduces them into the solvent. Brown was the lead co-author, with Martin Iwanicki ’16, on a paper covering the research in the international journal “Europhysics Letters,” published by the Institute of Physics in London in November 2016. Habdas and three researchers from the University of Pennsylvania contributed as secondary authors. Brown will continue his studies next year at the University of Rochester, where he will pursue a Ph.D. in physics. “Whether I was conducting research, teaching, or simply studying for my classes, my time in the physics department here at SJU gave me the foundational knowledge I hope to carry with me for the rest of my career,” Brown says. A full profile about Brown is available on the SJU News website. 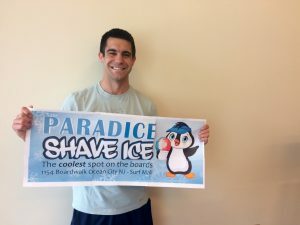 As graduation approaches, Bobby Lattanzi ’17, a sports marketing major with a family business and entrepreneurship minor from Abington, Pennsylvania, is relying on the important lessons he’s learned at SJU to guide him in his next venture: owning and operating his business, Paradice, a shave ice shop on the Ocean City, NJ boardwalk. Lattanzi, who is also a resident assistant, orientation leader, Weekly Service volunteer and member of the Booster Club at SJU, founded Paradice in the summer of 2016 and worked long hours every day from June until August to maintain the business. His start-up costs were low, and as the only employee other than occasional help from his family, Lattanzi was able to truly make Paradice his own. After graduation, Lattanzi is heading back to the Jersey Shore to operate Paradice for its second summer. “My goal is to be able to continue making a living engaged in practices that I am passionate about,” Lattanzi says. 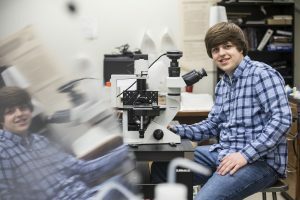 Senior biology major Michael DiMuzio has always had a passion for science. But the future medical student was propelled in the direction of the health care field after a battle with leukemia that began in middle school. Due to his almost daily visits to the hospital, DiMuzio was homeschooled with visits from his high school teachers during the first semester of ninth grade. By the second half of his freshman year and through the end of his treatment in his junior year, he was able to attend classes. “I am now five years in remission and finally moving onto survivorship,” he says. The experience left him with a desire to help others through medicine. “The compassion that came from my doctors and nurses at CHOP, backed by their expertise in caretaking, inspired me to go into medicine as a way to give back and help those in need,” he says. In addition to his biology major, DiMuzio also carries a minor in health care ethics. This summer, DiMuzio will begin the M.D. program at Sidney Kimmel Medical College at Thomas Jefferson University in Philadelphia, with hopes to also earn his Ph.D. in the future. “Thanks to my experiences at SJU, I am excited to see how I can use research to affect the field of medicine in the future,” he says. A full profile about DiMuzio is available on the SJU News website. 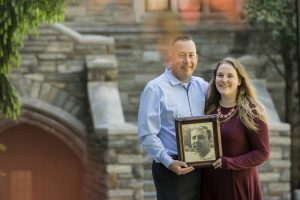 In 2013, Alexandra Homan made the decision to attend Saint Joseph’s University with the help of three people: her mother, her grandfather and His Holiness Pope Francis. The first time she set foot on Saint Joseph’s campus, the Cherry Hill, New Jersey, native felt at home. Still, Homan had reservations about leaving for college and adding financial pressure on the family. Her mother and grandfather were encouraging, but she felt she needed a sign that she was making the right decision and that attending Saint Joseph’s would put her the right career path. “My mom and I both value our faith, and we are big on signs — listening to God when making decisions,” she says. On national college decision day, May 1, 2013, as she readied to make the decision official, Homan was alerted to a tweet by Pope Francis: “Dear young friends, learn from Saint Joseph. He went through difficult times, but he always trusted, and he knew how to overcome adversity.” Talk about a sign! During her four years at Saint Joseph’s, Homan strived to live the values instilled in her by her family, and the Jesuit ideals espoused by Pope Francis and the Saint Joseph’s community. A leadership, ethics and organizational sustainability (LEO) and marketing major, Homan also participated in APEX, serving as a leader during her senior spring break, and was a resident assistant and an orientation leader. As with her extracurriculars, Homan’s desire to give back guided her academic path. “My LEO classes opened my eyes to all the ways companies can be mindful and sustainable,” she says. 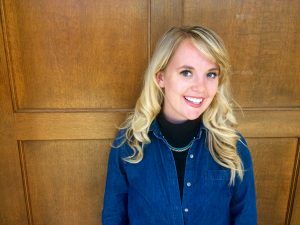 She interned with Campbell Soup on The Soulful Project, an initiative that donated food to local foodbanks when consumers purchase certain products, and worked on a capstone project to help the company become B-corps certified. After graduation, she’ll be working at L’Oreal, named one of the 2017 World’s Most Ethical Companies by the Ethisphere Institute for the eighth year in a row. 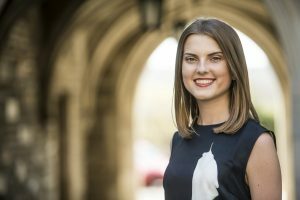 Homan hopes to continue to excel at the company and is interested in becoming involved in researching consumer responses to sustainable products and initiatives as well as educating consumers. “It’s a company and a community I could see myself growing with,” she says. A full commencement profile on Aly is available on the SJU news site. Andrew Arner ’17, an interdisciplinary health services major with minors in biology and interdisciplinary health care ethics from Bethlehem, Pa., has always known that he wanted to follow in his grandfather’s footsteps and work in medicine. 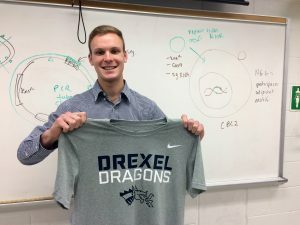 This fall, Arner’s dream will be realized when he enters the physician’s assistant program at Drexel University, one of the top PA programs in the country. 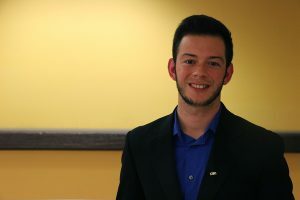 Arner, who serves as secretary of Alpha Epsilon Delta Pre-Medical Honors Society and is also a member of Alpha Sigma Nu Jesuit Honors Society, credits his internship at Saint Luke’s University Health Network in Bethlehem, where he amassed nearly 1,000 hours of clinical experience, as playing a strong part in his success. Amarendranath (Amar) Reddy Donthala ’17 (M.S.) is a storyteller. “I enjoy the opportunity to express myself creatively,” he says. But instead of using words, this former computer programmer from Hyderabad, India, weaves his narratives with data. 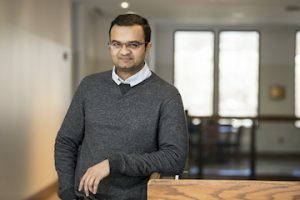 While earning his Master’s of Science in business intelligence & analytics (MSBI) at Saint Joseph’s, Donthala became enamored with data visualization. During a data mining class, he was introduced to interactive data visualization software Tableau and became hooked. At the invitation of fellow business intelligence student Corey Jones ’16, now a Tableau ambassador and associate financial analyst for Johnson & Johnson, Donthala joined the SJU Tableau user group. He began participating in the program’s “MakeOverMonday” challenge, which invites participants to represent a set of data in a new, more creative or compelling way. Combining his computer design skills and new affection for data visualization, Donthala even designed the international event’s logo. 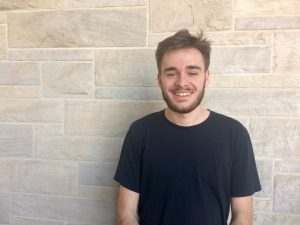 With three other students, he started a Tableau clinic offering drop-in sessions on campus for anyone looking for help with data visualizations. After graduation, Donthala will turn his passion into a career as a data visualization analyst for Comcast, working with Tableau. A full commencement profile on Amar is available on the SJU news site. Imani Briscoe is grateful for her time at SJU. 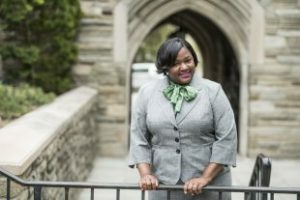 She’s taken advantage of the many leadership opportunities found on campus as a resident assistant, Hawk Host, co-President of the Black Student Union, Orientation Leader and L.I.N.E.S. performer. She also studied abroad in South Africa, Namibia, Zambia and Botswana and interned at Sister Namibia, a feminist and LGBT magazine, during her time overseas. “What I’ll miss most about SJU are the opportunities to challenge and change,” the Philadelphia native says. This year, Briscoe will be one of two SJU students recognized as the first graduates of the Lenfest Program, which identifies standout students as early as seventh grade and awards them incentive-based college scholarships. After graduation, the communication studies major plans to travel to California to interview with internet media companies Buzzfeed and Vice. Not only has Clare Kocman ’17 accepted a full time job after graduation, but she’ll also be moving to a brand new city in order to pursue it. Kocman, a risk management and insurance major with a marketing minor from York, Pennsylvania, will be working at Marsh and McLennan, an insurance brokerage in New York City. 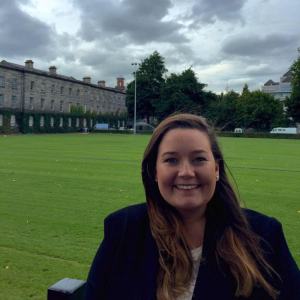 Though Kocman has built a large network of connections at SJU — in addition to being a member of Gamma Iota Sigma risk management and insurance fraternity and Alpha Gamma Delta sorority, she works as a Hawk Host campus tour guide, volunteers at Our Mother of Sorrows, and studied abroad in Galway, Ireland in the fall of 2015 — she is looking forward to meeting new people in New York. Eric Adjei-Danquah ’17 may be graduating, but he isn’t ready to stop learning, yet. 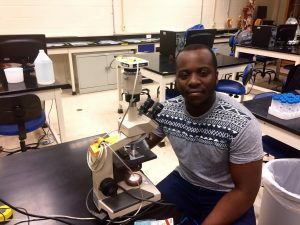 A biology major with minors in health care ethics and behavioral neuroscience from South Philadelphia, Adjei-Danquah will be receiving his M.Ed. from the University of Notre Dame through the Alliance for Catholic Education (ACE) ND. As part of the program, Eric will also be teaching biology at Cristo Rey High School in Atlanta while completing his graduate degree. Ultimately, however, Adjei-Danquah is working toward a career in medicine. Learning how to teach through ACE ND will allow him to be a more communicative, grounded physician in the future. A dynamic learner with many interests, Adjei-Danquah is well prepared for the challenges of teaching and eventually attending medical school. While at SJU, he served as an orientation leader, resident assistant, Summer Scholar, research assistant in multiple labs, and a fellow in the Institute for Clinical Bioethics. Sue Henry ’17 has always been an artist at heart. But the path to her passion hasn’t always been a straight line for the 60-year-old graduating senior. After graduating from Harcum College in 1980 with an associate’s degree in veterinary technology, she worked alongside researchers at the University of Pennsylvania School of Veterinary Medicine, completed technical training at Thomas Jefferson University Hospital and started a career as a full-time ultrasound technician. But despite all her success, she felt a pull for something more. 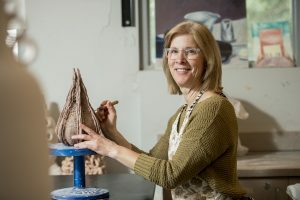 She quickly re-immersed herself in ceramics, taking classes at local art centers, connecting with fellow artists and selling her work at craft shows. However, after a degenerative osteoarthritis diagnosis that prevented her from using her hand for ceramics, she decided to return to school to finish her bachelor’s degree. She scheduled meetings with several local universities, and the first school on her list was Saint Joseph’s. “I found the idea of going back to school to be very daunting, but the admissions counselor made me feel more confident and reassured me that what I intended to do was feasible,” she says. It wasn’t until her third year at Saint Joseph’s that Henry glanced back at her passion. “My hands were feeling better and I really missed art, so I decided to sign up for Drawing I,” she says. “My professor — Steve Cope, M.F.A., assistant professor art — was so inspiring. The class filled a void in my life.” The next semester, she enrolled in a ceramic firings class and Drawing II and added an art minor. Before long, the minor became a major. Because her art has flourished so much in an academic setting, Henry hopes to continue her studies in graduate school. While she weighs her options, though, she wants to pass the passion on to others. A full profile about Henry is available on the SJU News website.